This post accompanied Sustained Spinning videos released by Spiral and myself early 2007. The Sema ceremony is one where the dervishes spin at length around one another, for an audience. I have read that watching this ritual can induce a calmed, transcendent state similar to that felt by the whirling dancer. In this ceremony, the dancer’s mind is allowed the opportunity to tune in with the revolving of the entire universe. I hope that you were all left at peace and feeling connected with the cosmic whirling. 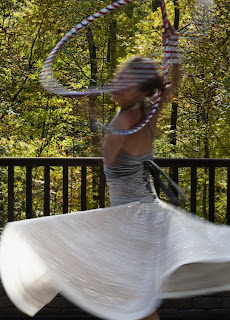 TECHNIQUE: Focusing softly on a point that stays in focus – on the hoop or hand- helped me tremendously in the beginning of my spinning journey. As time has gone on, I have been able to loosen my gaze to eventually leave it unnecessary. I have experienced breakthroughs over the years, in length and variation of the spin, that have left me feeling confident about no longer needing the gaze and eager to try to spin blind. If you begin to get dizzy, embrace the surge of energy that rushes through you instead of stopping abruptly. STOPPING makes me MORE DIZZY and sends a potentially intense, and possibly unpleasant, rush to the head. Slow down gradually. I’ve read that the nausea, if you experience it, can linger for a couple of days. So, maybe try adding length of time or increased speed, little by little, until your system can retain its equilibrium amidst the spin. Personally, I have always had an affinity for dizziness and remember the first time at age 16 that I got the “spins” from my first time drinking a couple of beers. I really like it. I remember the delight of feeling my body dizzy while sitting still, eyes closed, remembering the days of whirling in my grandmother’s rocking and spinning chair, turning in circles as a child ‘til falling in the grass and riding the tilt o’ whirl at carnivals. I’m glad I have found a healthy way to achieve this sensation and have connected with others who find themselves attracted to “spinning” in variations throughout cultures and times. 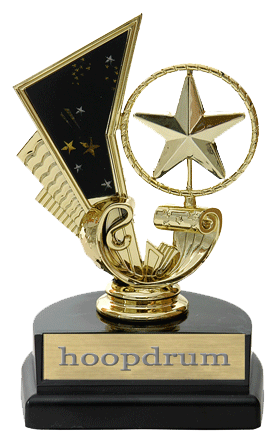 © 2005 hoopdrum, LLC. Picture Window theme. Powered by Blogger.